Greater Grand Forks is comprised of two main cities: Grand Forks, ND and East Grand Forks, MN. 20 miles west is Grand Forks Air Force Base, one of our nation's top UAS facilities. We are also home to the University of North Dakota, a Division I school with an enrollment averaging just below 15,000. Our two cities embody one lively, bustling community surrounded by tranquil, scenic farm country. It's a place that feels "warm" even in the winter...where you'll find plenty to see and do, in addition to meeting some of the friendliest people to be found anywhere. Includes Cities/Towns: East Grand Forks, Grand Forks. Shop till you drop at big box southend stores and unique downtown boutiques. Cheer on championship sports teams at Ralph Engelstad Arena or Grammy winning entertainers at the Alerus Center. Check out a Picasso hanging in the North Dakota Museum of Art or say hello to Dali at the Empire Arts Center Gallery. Paddle your way up the Red River, then take a stroll or roll on The Greenway. Indoor and out, we have lots of SimplyGrand ways to entertain you. With a thriving local music scene, flourishing performing arts community and more talented artists than you can shake a paintbrush at, our cultural venues play host to SimplyGrand happenings every day. Get ready to sip, savor and stroll through our beautiful Downtown District, as local businesses host and display works by regional artists while offering samples of fine wines. One of the region’s most popular blues festivals, this 3-part summer music series features top notch musicians from around the country; plus, great food and brews. Learn about our community’s legendary past when attending this annual East Grand Forks Heritage Village event. Some of the fun happenings include a parade, community dinner, live music, historical re-enactments, classic car show and antique tractor pull. Enjoy four days filled with talented artists performing live music in a variety of genres ranging from rock, country and folk to jazz, gospel and soul. There’ll also be a beer garden, numerous food trucks, plus games for both kids and adults. It all takes place Downtown, on The Greenway, by the banks of the Red. 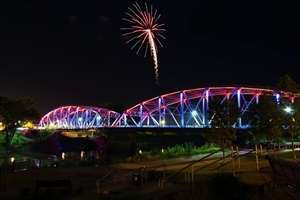 Celebrate the Red River Valley’s staple crop with a variety of events that include a 5K fun run, parade, UND football game and tailgate party, potato pancake breakfast, contests and the World’s Largest French Fry Feed & Fireworks display. Kick off the holiday season in simply grand style at this popular family friendly event held the first Sunday after Thanksgiving. Festivities include a lighted parade, caroling, cookie decorating, live entertainment, kids’ games, carriage rides, ice skating and fireworks. Jan -4.0 F° 5.3 F° 14.5 F° 0.8 "
Feb 3.5 F° 12.9 F° 22.3 F° 0.6 "
Mar 16.9 F° 25.6 F° 34.3 F° 0.9 "
Apr 31.0 F° 42.2 F° 53.4 F° 1.2 "
May 43.8 F° 56.5 F° 69.1 F° 2.1 "
Jun 53.6 F° 65.3 F° 76.9 F° 3.0 "
Jul 57.7 F° 69.2 F° 80.7 F° 2.9 "
Aug 55.5 F° 67.8 F° 80.0 F° 2.9 "
Sep 45.2 F° 57.0 F° 68.8 F° 2.0 "
Oct 33.8 F° 44.3 F° 54.7 F° 1.6 "
Nov 17.9 F° 25.6 F° 33.2 F° 0.9 "
Dec 2.7 F° 11.0 F° 19.3 F° 0.6 "
The Grand Forks Senior Center offers assistance to all those looking for paid and volunteer opportunities; plus, our community has numerous job openings in a variety of professions.